Also see: "Reinhard Gehlen's Man in Louisville (and Saddam Hussein)," and "Fascist Propaganda at Family Security Matters: Praise for Nazi Reinhard Gehlen"
The German affiliate is Western Goals Europe E.V. (5) This German branch is also known as the American-European Strategy Institute. It acknowledges working with Reinhard Gehlen, a former Nazi who has been honored by the elite lay Catholic organization, the Knights of Malta (SMOM). SMOM gave its highest award of honor, the Gran Croci Al Merito Conplacca, to Gehlen in 1948. During World War II, the OSS had infiltrated nearly two hundred agents into the Third Reich--almost three times as many as had been sent by Britain. Its operatives were inserted into almost every militarily significant city from Vienna to Berlin, Munich to Bremen. In all, over 70 cities had been salted with OSS spy teams by war's end. The casualties had been heavy, but not exorbitant. Of the total number of agents that worked behind German lines, only thirty-six had been killed or captured. And of these, the majority were lost in the waning days of the war in the vicinity of the Last Redoubt of Bavaria. It was at this time that almost every civilian found on the road by the Gestapo was detained and questioned as to why they were not in uniform for the Fatherland, or at least under arms in a home defense unit. Even the best cover stories provided to the young OSS agents might fail such a test. Many did. Still, the organization as a whole was remarkable in its conception, implementation and execution. The bravery of the field teams was beyond question. They were a necessary entity, brought about by drastic circumstances. But after Germany surrendered, the need for specially trained spy-commandos was considered by the White House to be nil. In fact, Truman considered the OSS a peacetime liability. In a letter to General Donovan, he wrote: "I want to take this occasion to thank you for the capable leadership you have brought to a vital wartime activity in your capacity as Director of Strategic Services. You may well find satisfaction in the achievements of the Office and take pride in your own contribution to them." He then promptly took steps to abolish the service, dividing the few necessary peacetime functions between the State Department and the War Department. But from the ashes rose a new organization. One much more powerful--and sinister. And it would be an organization that would grow much faster than anyone could ever dream. For a very good reason. On April 1, 1945, a convoy of eleven trucks wound its way through Bavaria, traveling south from Berlin, away from the advancing Red Army who was at that moment conducting their own blitzkrieg through eastern Germany. Aboard the trucks were hand-picked German intelligence officers who guarded a very special cargo. Inside crates that had been carefully stacked and hidden under the canvas tops of the trucks were the most valued prizes of the head of German military intelligence: the files on Russia. The purpose of the convoy was not to transport the documents to the Last Redoubt, but to remove them from harm's way altogether for use as future bargaining chips with the advancing Allies. For the files, which were the fruit of five years of intensive intelligence gathering on Russia, were now the personal property of a youthful 40 year-old general named Reinhard Gehlen. And with them, he planned on bargaining his way to a very special arrangement--with the Americans. Reinhard Gehlen, known as Hitler's spy master, had overseen a huge organization of more than 3500 spies scattered throughout both Eastern Europe and the Soviet Union. His top officers, Nazi zealots who had committed some of the most atrocious crimes of the war, had proven very effective in their efforts to extract information from prisoners and insert agents into Russia. The spies that were sent into the Soviet Union infiltrated not only the Red Army, but even the Soviet General Staff. The records Gehlen had amassed over the previous four years would be invaluable to the Allies--especially a select group of very interested Americans. Now it was only a question of saving the files and making the proper contacts on the American side. Gehlen was confident a suitable arrangement could be made for not only himself, but his organization. And prepare they did. Within the crates were documents that detailed roads, bridges, factories, military installations, airfields, water supplies, communications sites and virtually every item of interest inside Russia and the satellite countries to a military planner. But of more interest were the hundreds of files he had amassed on the personnel at the top of the Soviet military machine including the Soviet High Command. Much of this information was derived by interrogation, torture and starvation of selected officers and soldiers of some four million prisoners taken on the Eastern Front. Those who did not cooperate were summarily executed. Those that did were often executed afterwards when they were deemed of no further value. It was for these reasons that Gehlen and his officers were adamant about being captured by American forces. If they were taken by the Russians, they knew what would happen to them. Two months before Germany surrendered, Gehlen made his move. Along with a group of his most trusted senior officers, he microfilmed the vast horde of documents and had them sealed in water-tight metal drums. These drums were covertly removed from army headquarters in Berlin and transported to secret cache sites throughout the Austrian Alps. It was well for Gehlen that this effort was made. For when the convoy of trucks transporting the hard copies of the files reached central Germany, the convoy was spotted by Soviet planes and bombed. Five of the eleven trucks were destroyed, and with them, the files they carried. Gehlen and his officers, after abandoning Berlin to make their way toward Switzerland and the Americans, were--according to official history--indeed fortunate. When they finally found an American unit to surrender to, instead of running into a by-the-book American officer who might have offered them up to the Russians in accordance with the Yalta agreements, they encountered Captain John Bokor. Boker, who was described as a pragmatist who regarded the Soviets as the next potential enemy, impressed Gehlen as a person who, "...had no illusions about the way political events were turning. We became close friends." Bokor, according to Gehlen's memoirs, ignored official policy. When he found out about the secret caches of records, he allegedly decided on his own to keep the matter confidential and quietly work to hand Gehlen, the records and the men of Gehlen's spy network over intact to the OSS. Then, according to Gehlen, Bokor quietly went around removing the names of Gehlen's men from the rosters of war criminals. Once this was accomplished, Gehlen turned part of his records over to Bokor who promptly spirited them away from the interrogation center without even Military Intelligence knowing of their existence. Within ninety days Boker had direct liaisonCand the personal support of--General Walter Bedell Smith, Chief of Staff of the Allied Supreme Command (who later headed the CIA), and General Edwin Sibert, the highest ranking military intelligence officer in Europe. Quite a feat for a mere captain. At the same time, Gehlen's existence in Allied hands quite coincidentally became known to General "Wild Bill" Donovan, head of the OSS, and his station chief in Europe, Allen Dulles. In August, Gehlen and three assistants were covertly flown to Washington and secreted away at Camp David for interviews with both Military Intelligence and the OSS. Apparently the OSS offered the best deal, for within a eighteen months the Gehlen Org, resurrected from the original Nazi spy network, had been installed in West Germany to act as the eyes and ears of the newly-created CIA. The story that Captain Bokor, using great foresight and planning, managed all of these feats of clandestine operations on his own is too incredible to be true. It is not probable that a company-grade officer would risk his career to protect a Nazi war criminal, or put himself personally in jeopardy by wantonly violating international agreements. In any normal case, such activity would earn him a courts martial. It is even more improbable that Gehlen would stumble into the one American in a thousand that would quickly see the value in what Gehlen purported to offer and immediately begin work to protect not only Gehlen, but his officers. What is more believable is that Gehlen had made these arrangements far in advance. By using certain trusted contacts within the German High Command who had both pre-war and current business dealings across national boundaries, Gehlen had coordinated a deal with a specified contact within the American intelligence community. Namely Allen Dulles. Dulles knew Gehlen was coming. In April, one month before the war ended, and forty-five days before Gehlen surrendered to Bokor, Dulles ordered an aide to begin talks with the German general through intermediaries in Berlin. While the Paperclip scientists were setting up shop in the U.S., Reinhard Gehlen began reestablishing his presence in West Germany. His organization, the Gehlen Org, quickly regained control of the majority of his former agents inside the Iron Curtain, and with the help of many of his former staff, put them back to work. Though he agreed not to hire any former Gestapo, SS or SD members, he sought them out and put them on the payroll--the CIA's payrollCregardless of his promise. And the CIA did not stop him. 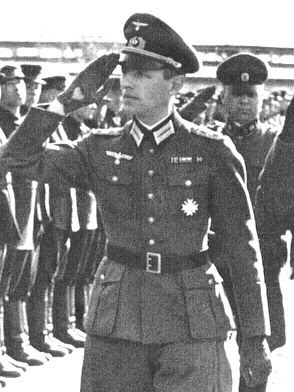 Among his recruits were Dr. Franz Six and Emil Augsburg. Six and Augsburg had been members of an SS mobile Death's Head killing squad that hunted down and killed Soviet Jews, intellectuals and partisans wherever they could be found. Six was known as a Streber, or Eager Beaver, for the enthusiastic manner in which he pursued his job. Gehlen also recruited the former Gestapo chiefs of Paris, France, and Kiel, Germany. Then, that not being enough, he hired Willi Krichbaum, the former senior Gestapo leader for southeastern Europe. Gehlen was pleasantly surprised by what happened next. His new employer, the OSS, not only encouraged but financed an escape mechanism set up by Gehlen for former Nazis. The Gehlen Org established, with OSS help, "rat lines" to provide an underground escape network to be used by former war criminals to escape prosecution by German war crimes tribunals. By way of this organization, over 5,000 Nazis secretly made their way out of Europe to relocate around the globe. Most went to South and Central America. The countries of choice were Argentina, Chile, Nicaragua and El Salvador. Within a few years after their arrival in these particular countries, the infamous right-wing government "death squads" made their first appearances. Of note in the expatriate community were such characters as Dr. Joseph Mengele, who specialized in crude genetic experiments on Jewish concentration camp inmates, and mass murderer Klaus Barbie, the infamous "Butcher of Lyons." To satisfy his new employers, Gehlen realized that he had to produce information that was of value to Washington. He also realized that for an intelligence organization to be of value, and to justify a large budget, it had to have an entity that was considered a deadly threat to spy on. He knew that the Americans had little knowledge concerning both the Russians as a military machine, and what activities were transpiring behind the Iron Curtain. The Red Menace would fit the requirement of the ominous threat nicely. All Gehlen had to do was paint as bleak a picture of the situation as he could, and continue creating reports that indicated that the scenario was continually deteriorating. The more bad news he gave Washington, the more money he would have to work with. He knew that in peacetime, the only way to justify a large intelligence organization was to make sure there was always "an enemy at the gates." He began by feeding information to Dulles--and consequently to Truman--that appeared to show that the Russians were poised to attack the West. He reported that the Soviet forces in eastern Europe were comprised of 208 crack assault divisions, most of which were high-speed capable motorized rifle and tank divisions. Such figures showed that the Communists outnumbered the Western forces by a ratio of ten-to-one. Then, in early 1947, he reported to the fledgling CIA that his agents had noted subtle changes in Soviet billeting and leave policies, and that troops were being recalled for some unspecified reason. He alluded that this could be the beginning of a preparation phase for the suspected invasion. This was followed by Gehlen's prediction that the Russians would move quickly once all troops and equipment had been activated and put into position for attack. It wouldn't be long until there was a Soviet blitzkrieg. In actual fact, Gehlen's information could not have been further from the truth. By 1946, the Red Army was an over-extended, under-equipped, and exhausted force of combat-riddled units. Many of the battalions that had reached Berlin had done so on foot. There was not even sufficient motor transport to move one entire division without depriving another of its motorized assets. Almost half of the Red Army's transport was horse drawn. In addition to this, U.S. Army Intelligence had established that the majority of Soviet forces in Eastern Europe was bogged down in rebuilding the eastern zones, reorganizing security structures, and performing governmental administrative functions. According to the intelligence estimate, the Soviet ground and air forces would not be combat effective against the Western powers for at least the next decade. The 10:1 Russian superiority figure that Gehlen referred to was unrealistic from the beginning. Gehlen well knew, as did Dulles and the other veteran OSS agents, that the Soviet divisional structure was far less in numerical manpower than its U.S. equivalent. A Soviet division was typically one third as strong as an American division. And its leadership was far less effective. Instead of being able to function in combat with flexibility by making on-the-spot field expedient decisions, the Soviet officers had to wait for orders from upper echelon before reacting to a change in the flow of battle. This fact in itself often caused the Soviets grievous losses, and even defeats, during land battles. The U.S. forces, on the other hand, encouraged battlefield decisions during the heat of conflict to be made at the lowest levels. The results of such activities were exactly what the intelligence communityCand the militaryCwanted. Truman ceased cutting the military budget; increased spending for weapons research, military equipment, aircraft and the space program; ordered an increase in the development and construction of nuclear weapons; and most importantly to the young CIA, began pumping millions of dollars into the "black" budget for covert operations. In the ten years that followed the war, the CIA consumed over $200 million dollars of funds that did not have to be accounted for. According to Victor Marchetti, former chief analyst on Soviet military capabilities and author of The CIA and the Cult of Intelligence, "The agency loved Gehlen because he fed us what we wanted to hear. We used his stuff constantly, and we fed it to everybody else: the Pentagon; the White House; the newspapers. They loved it." Marchetti further explained, "Gehlen had to make his money by creating a threat that we were afraid of, so we would give him more money to tell us about it. In my opinion, the Gehlen organization provided nothing worthwhile for understanding or estimating Soviet military or political capabilities in Eastern Europe or anywhere else." The final result of all these cloak-and-dagger exercises was a reputed Cold War that lasted for almost half a century, and cost American taxpayers alone over $8 trillion dollars. Peacetime intelligence gathering had become big business--profitable to not only the growing intelligence organizations, but to the defense industry and the investors who financed both it and the government. [i]. Covert Action, Fall 1990. [ii]. Covert Action, Winter 1986. [iii]. Blowback; America's Recruitment of Nazis and Its Effect on the Cold War, by Christopher Simpson, (Weidenfeld & Nicolson), 1988.